As I look back over the last few posts, it seems I've always been showing and talking about unfinished projects. Hopefully all of them will be done someday! But today I have the pleasure of showing you a real, honest-to-God finished product. 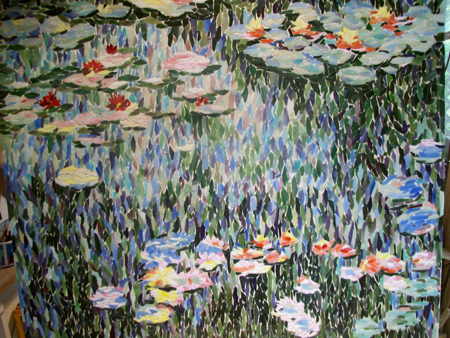 It's the first of two panels, 48" by 40", with the subject of Monet's "Water Lilies." My clients have seen the originals at L'Orangerie in Paris, and they wanted to see if it could be re-created in mosaic. To tell you the truth, I was not so sure at first. I'm used to piecing together random shards or tiny squares of glass or tile, but this project required a different technique so that it would have more of the flowing quality of water. I experimented and came up with a vaguely oval-shaped piece that I cut randomly from sheets of stained glass. 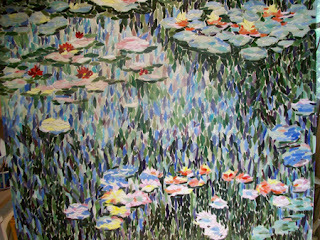 They are laid horizontally where the intention is to portray a lily pad, and vertically for the background water with its refections of the surrounding trees. The second panel will be another view of the pond.